I'm back for another day of Lawn Fawn inspiration. 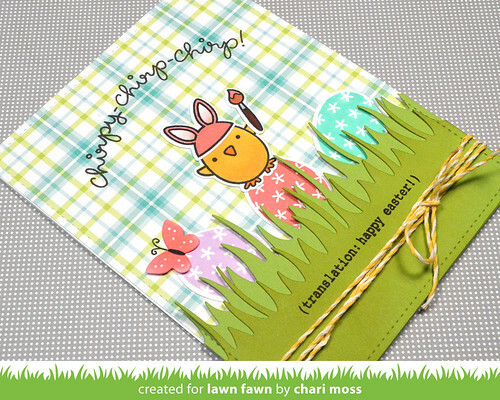 Today I have a card featuring the new set Chirpy Chirp Chirp. This is a great easter and spring set but there are some sentiments included that make it useful year round. I colored my little chick with copic markers and stamped out the painted eggs in Lavender, Wild Rose and Merman. I created two layers of Meadow borders for the bottom, I added some distress ink to the top layer so that they would be slightly different greens. I used a piece of Ivy paper for the background and curved my sentiment over top of the chick. The little butterfly is cut using the shape included with the Meadow border dies, I colored it with copic to match the colors on the chick and added the white gel pen dots and drew in the body and antenna. I finished it off with some lemon lawn trimmings twine. 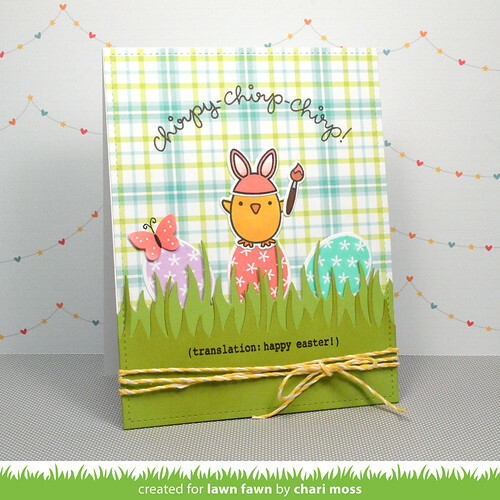 Thanks for stopping by today, please check out the Lawn Fawn blog for more Chirpy Chirp Chirp projects as well as tote bag projects. On another note... I am a guest this month for Butterfly Reflections Ink so please hop on over and visit the Butterfly Reflections Ink blog later today and check out the card I created. Super cute! The colors are adorable! Lots of Love: Will You Be My Valentine? Lots of Love: Whale You Be Mine?